'What We Salvage' Is A Difficult, Rewarding Punk Odyssey If you didn't grow up in the punk subcultures of the 1980s and '90s, you might have a little trouble with David Baillie's new novel — but stick with it; the book reveals a vicious grace and honesty. 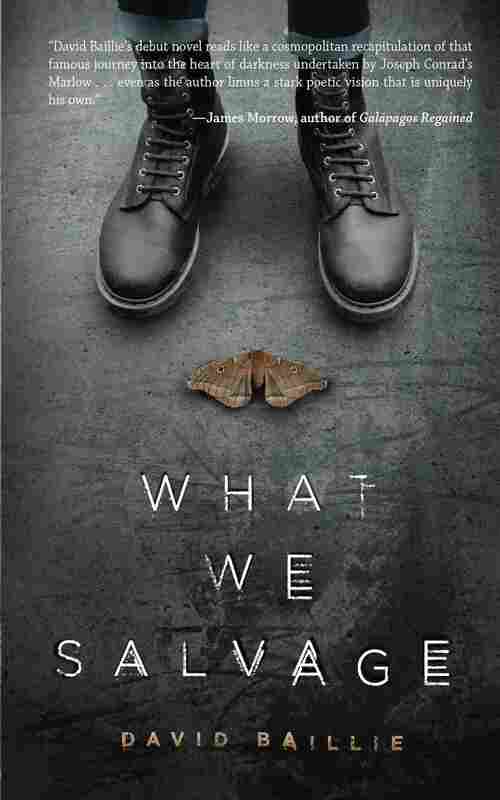 As someone who cut his teeth on the punk subculture of the late '80s and early '90s, I'm captivated by David Baillie's daring debut novel What We Salvage. But I also wonder how tough it might be for those who aren't familiar with that subculture to wade through the tangle of lingo, references, and signifiers that form the book's rich backdrop. Don't get me wrong — What We Salvage is by no means intended for punk audiences only. The story of a young man, his little brother, and the friends and lovers who crisscross their violent lives, What We Salvage has a poetic, emotional, universal core. At the same time, it's a grim vision of urban alienation that pulls no punches and refuses to simplify. At the start of the story, the unnamed narrator is a sixteen-year-old kid living in Hamilton, Ontario. His brother, nicknamed Tribal, is a year younger, and they're embroiled in frequent street violence with gangs of racist skinheads. But Baillie isn't interested in exploiting the stereotype of skinheads as racist neo-Nazis; although they do appear here, the book explores a broad range of skinhead subcultures — including those of the antiracist, reggae-loving variety. In fact, the subtle differences in uniform and ritual between skinhead factions become symbolic of the narrator's constant fear and anxiety: He lives in a world where the slightest misstep in deed, word, or dress can mean a curbside stomping. The narrator himself is a mod — think the parka-wearing, pill-popping protagonist of Quadrophenia, the 1979 film adaptation of The Who's classic album — whose love for The Who becomes the template for a complex personal mythos. He's a teenage thug from a bad home, but he's also a sensitive soul who sees the broken beauty in the world around him. And he's able to express that damaged wonder in terms that are as lyrical and philosophical as his everyday reality is stark and harsh. The reason for the narrator's sesquipedalian inner monologue winds up being as mundane as it is profound: When he's not playing guitar, pursuing girls, or running riot in the streets, he's holed up in the public library, treasuring quiet time alone with literature and his own thoughts. The assortment of characters that drift in and out of his life as the '80s pass into the '90s range from Jimmy, a streetwise mate with hidden wisdom, to Yvonne, a librarian with whom the narrator forms a complicated bond. The plot doesn't progress so much as at it sporadically fragments and reforms — but what's at first a disorienting narrative gradually assumes a powerful rhythm. As the book morphs from the hard thump of the street into something more cerebral, it unveils a vicious grace, not to mention a scalding emotional honesty. Hints of Anthony Burgess's A Clockwork Orange abound in What We Salvage's lingo-heavy, ultraviolent beat. But there are just as many cinematic influences at play, from the street-gang fabulism of Warriors to the steely savagery of Romper Stomper to the culture-shock tactics of This Is England — all of which deal in unique ways with what it means to be disadvantaged, disaffected, and yearning to belong. Even Baillie's choice of a nameless narrator feeds into this: As The Who's Pete Townshend explores so often in his music, one of the foundations of the mod mindset is the facelessness and loneliness that comes from being part of a crowd, even if it's a crowd of one's choosing. Reading What We Salvage, I was faced with a tricky question: What's the difference between relating to a character and identifying with him? The book's narrator is neither wholly heroic nor particularly generous with his feelings. At least at first. As the book morphs from the hard thump of the street into something more cerebral, it unveils a vicious grace, not to mention a scalding emotional honesty. If you didn't come of age in the punk scene, What We Salvage's obsession with the amphetamine-fueled warzones and urban underbellies of Canada might seem needlessly off-putting, or even ugly. But it's an ugliness worth acclimating to. Baillie has written one of the most beautiful and moving stories about raw brutality — and the things brutality can never conquer — that you'll likely find.